When my novel was published two years ago, it was by accident. I had been trying to write a book for years. I completed several, none of which were of the quality necessary to sell. Then, one day, I was struck by an idea. What if the last of humanity was trapped at the top of a tower, with no idea of how they got there? That was the initial idea for FLOOR 21. All that was left was writing, well, everything. I had to figure out why they couldn’t leave the Tower. Since I’d first had this concept while watching The Walking Dead, I had a brief flirtation with the thought that there were zombies on the lower floors. This idea didn’t last long, but I had the notion that there was a disease that kept them from leaving. This became the Creep, a biological infestation that responds to a person’s fears. The more scared they become, the more active the Creep, and the more active the Creep the more lethal it is (astute observers will notice a hint of Ghostbusters 2 in this concept). After that, the institutions in the Tower began to form. There was Security, meant to keep the peace on the upper floors where humanity eked out its existence. Then there was Tower Authority itself, which governed the upper floors. Locked on the top floor of the Tower, Tower Authority provided food to the people as best it could. However, it also actively tried to keep people from asking questions about how they arrived in the Tower . . . questions it couldn’t answer. There are those who scavenge the lower floors for food. Floor One residents live in luxury compared to everyone else. Throughout the conceptualization of the Creep, there was a notion that, if exposed to the disease long enough people could become infected by it. This became the underlying principle of Creepy Sally, a rumored creature who lived somewhere in a sealed part of the Tower. Nursery rhymes and scary stories were used as a way of keeping kids in line and indoors after curfew, with most of the stories revolving around how Sally could control the Creep itself. Jackie Coleman, the hero of FLOOR 21. Creepy Sally, an infested Creeper of the highest order. Of course, every story needs its protagonist, and for me that was Jackie Coleman. Jackie, an African American girl whose inquisitive nature was loosely based on a former girlfriend of mine, wanted nothing more than to find out how humanity had arrived in the Tower. Of course, with so much effort to oppress the truth, Jackie came into conflict with Tower Authority, setting up the conflict of the first book. In the Tower, floors are numbered backward. The top floor is floor one, and each lower floor is floor two, floor three, etc. 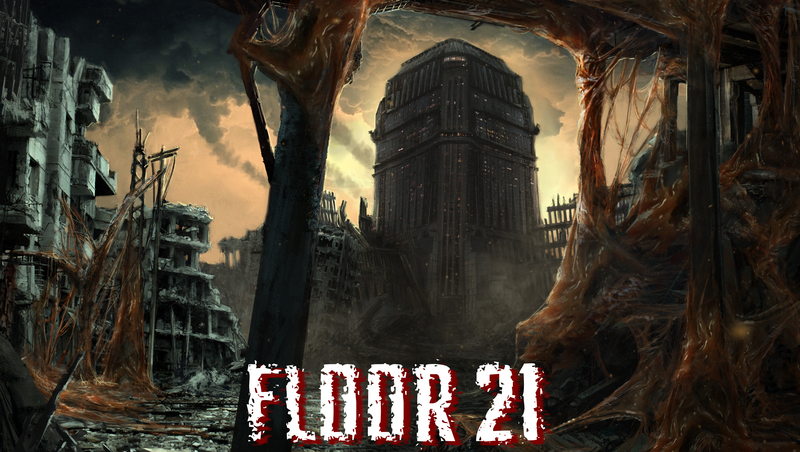 Floor 21 is the lowest anyone from humanity can travel before the infestation from the Creep becomes too great. Nobody lives beneath that floor. Even there, people hallucinate constantly as the Creep impacts their mental states. It’s a dismal way of living, and people only survive because of the Scavengers. Scavengers are a specific operating group in the Tower who are authorized to travel, every so often, below Floor 21 to scavenge up food and old technology. Book One purposely leaves a few questions about this process open. If the Tower has been around for centuries, why is it food is still fresh? Why is the Creep infestation worse the farther down you go? The Tower when fully operational. Book One was written in a much more juvenile or young adult tone, with ‘teen speak’ dominating a lot of it. Book Two starts to mature the story incredibly, and by Book Three, a lot of the old trappings of the story are gone. This was purposely done, to reflect Jackie’s transition from a still naïve teen to a hero in her own right. Book Two begins to discuss secrets that were left open in Book One, including whether anyone lives on the lower floors. Importantly, a new concept, called Pocket Space, is introduced. In the universe of Floor 21, Pocket Space is an important concept, as it exists as a parallel dimension to our own where objects can be stored and immediately accessed using energy portals. This removes the need for carrying around heavy equipment. However, the consequences of Pocket Space are far reaching, and extend beyond just easing transportation. Life inside the Tower is mostly hard. The story also begins to discuss the more obvious questions, such as what happened to the Tower and how humanity arrived there. Importantly, the story begins to open up about whether anyone is living outside. If you’ve been looking for a science fiction or dystopian novel that’s just a little different, that includes some light elements of horror and explores a lot of oddball technologies, FLOOR 21 may be up your alley. Book One, again, is written for a younger audience, but quickly matures beginning in Book Two. If you’re concerned the entire series remains trapped in its original writing style, no worries. The story sees Jackie’s rapid maturation as she goes from simple explorer to a leader of Scavengers herself, leading her team into the darkness in the bowels of the Tower as she seeks out the truth regarding what happened to humanity. You can buy it here. A view of the Tower from the infested outside world. The lower floors of the Tower are never safe. Jackie doesn’t stay a naive girl forever. Life inside the Tower is harsh.